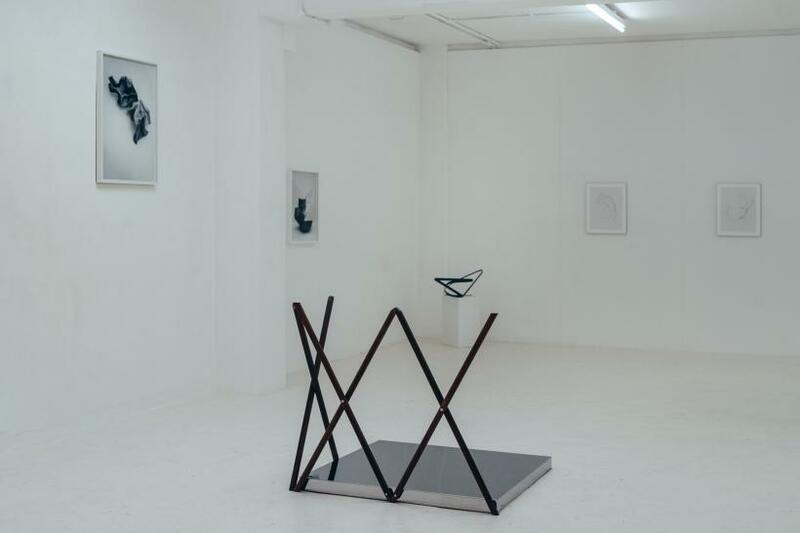 Assembled Spaces brings together the work of Tine Bay Lührssen, Nina Brauhauser and Ilka Helmig in their UK debut. The artist trio combine photography, sculpture and traditional and digital drawing with a considered harmony in the arrangement of the works. They zigzag between each other, creating a visual conversation which dictates no linear instructions, nor a start or end point, to the viewer’s navigation. 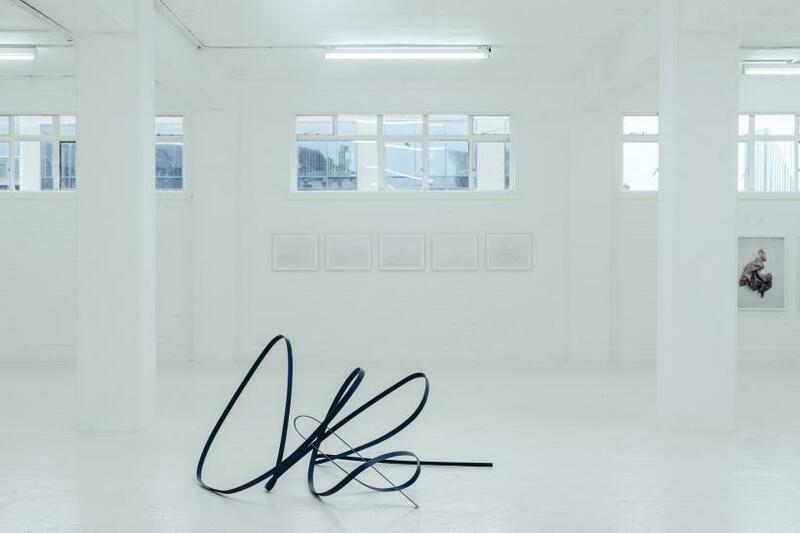 The exhibition invites the audience into a space that is given significance by the works operating within it; they expand and direct our perception within the literal white cube of KARST gallery. 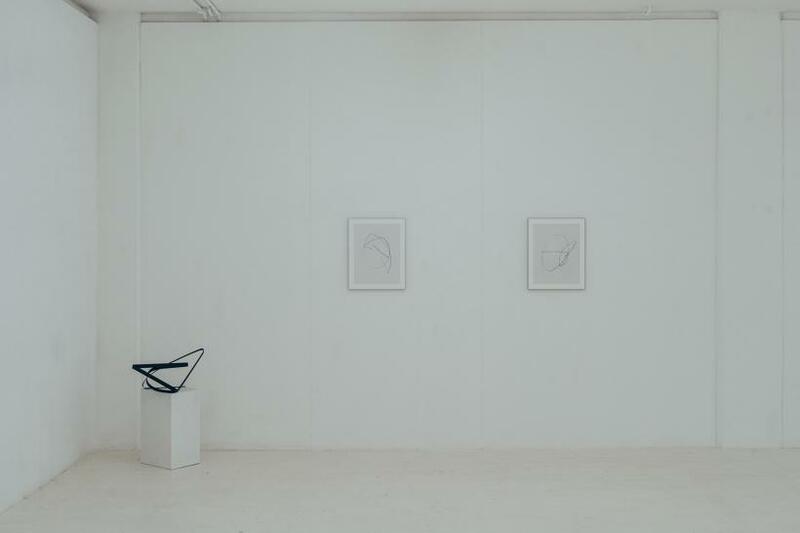 The exhibition space itself does not detract from the works; the white walls give them the quality of floating. 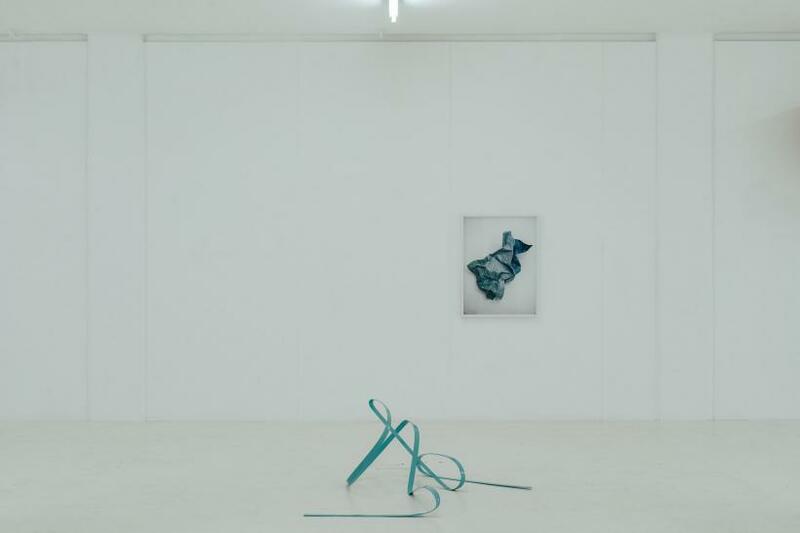 Lührssen’s wall-affixed Spatial Constructions seem unattached, whilst Nina Brauhauser’s aluminium sculptures, though situated on the floor, almost hover. Brauhauser’s sculptures are singular strips wrought into curves that contract and expand, like a ribbon suddenly thrust into action. They capture spontaneity - lauded by Danish Situationist Asger Jorn, a notable influence for the artists - communicating an essence akin to a particular moment in music or a flurry of emotion. 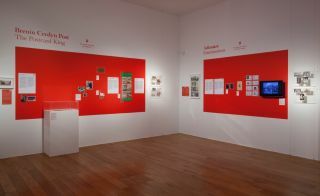 Their forms are echoed in the series of looped lines framed on the gallery wall, referred to by Brauhauser as ‘quotes’. The images – which at first seem like instinctive squiggles preceding the sculptures - are layered through extensive processing. Each quote is drawn, blown up, rendered as a 3D model and photographed, before the process is repeated again. Each result is jarring, caught between a static image and the motion of processes it contains. The sculptural work of Lührssen follows a dialogue between stasis and motion that tempts the viewer to interact. 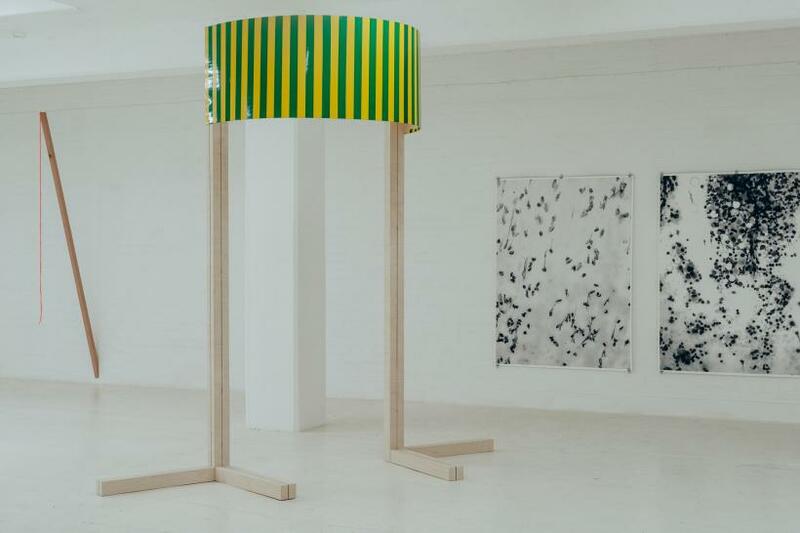 A fluorescent rope in Spatial Construction III hangs high and motionless, asking us to intervene, whilst the wooden frame of Spatial Construction I invites us to walk through. The cube, pole and plank composing Spatial Construction IV are deceptively simple; the combination seems like a puzzle to play with, the diagonal plank waits to be turned like a clock handle. 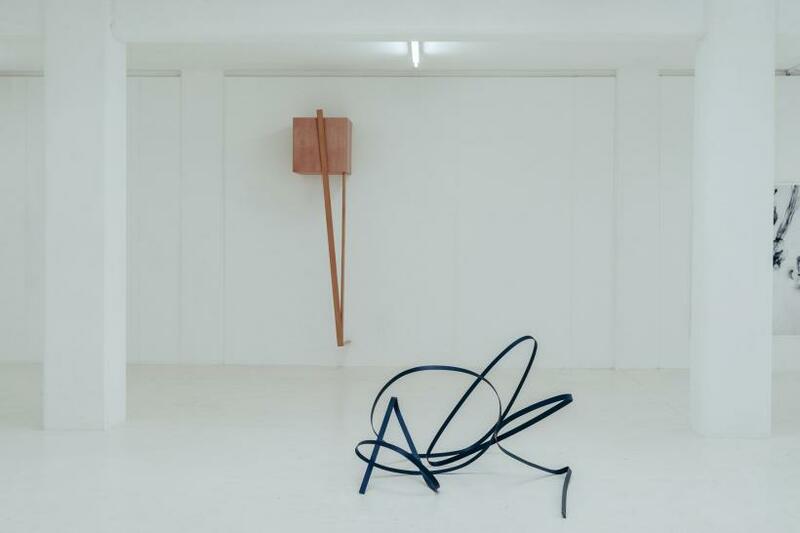 Lührssen’s sculptures seem caught in a temporary mode of stasis awaiting a prompt; the viewer is enticed to move the handle, swing the rope or step through the wooden frame. Something may happen, a hidden cog may begin to whir, a motion may be triggered. Of course, as the artist is aware, the viewer’s ability to intervene is limited; the boundaries between audience and participator are rumbled and expectations are left stirred. Additionally, Lührssen’s work brings bursts of colour to the exhibition’s generally subdued palette. Streaks of carnivalesque colours and fluorescent material embed a playful quality into a body of work that is ultimately unpredictable. Spatial Construction IV, for instance, consists of six wooden poles criss-crossed. The form implies the corner of a fence and therefore a mark of separation. This implication is transformed, however, by the mirror positioned at the base. Through reflection, the wooden form is doubled vertically and becomes more laddered than fenced. Here is something not to be cut off from, but to be gained. From another position, however, the structure appears to fall in on itself; the criss-crossed positioning looks more like entanglement. Though static, the sculptures become chameleon-like depending on our position. The work of Ilka Helmig also plays with perception, though elicited through the scale of the images themselves. Microscopic photographs are blown up; similar to Brauhauser’s ‘quotes’, they undergo a process. In this case it is enlargement that causes abstraction and ambiguity. The images here resemble moon craters and the biology depicted in the images enter, in the words of one title, a ‘cosmic spectrum.’ Presented on paper, without framing and subtly held with clips, these photographs have an unbound potential. Given that each depicts cancerous cells, this may be more loaded than the delicate presentation may initially imply. In her Contraction series, Helmig turns toward the artificial order through imagery of crumbled paper material. As the cells translate into planetary textures, here the folds and scrunches translate into hilly contours of landscapes. The tones of Contraction pair closely with Brauhauser’s aluminium sculptures, which share a muted yet impacting palette, allowing Lührssen’s colours to burst even more. The work of all three artists form a united body, with perception puzzles and processes that expand and shift the viewer’s experience. 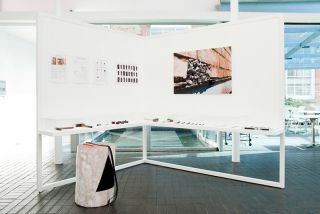 The exhibition broadens our notions of creativity through its combination of biological and artificial forms as well as digital and traditional methods. The works bounce between each other so energetically and conspire so closely, they undoubtedly emerge stronger from their intimate collaboration. With experimentation at its heart, Assembled Spaces shares its vision towards the expansive possibilities of art.